The name given to the communion meals of the early Christians, at which the rich and the poor, the master and the slave, sat together at one table, merging all distinctions of rank in fraternal union and fellowship. A good description of the Agape is given in Tertullian, "Apologeticus," xxxix. It began and closed with thanksgiving and song (see Grace at Meals), but had no specific religious character, nor any reference to the Last Supper of Jesus; at least not during the first century, as is seen from the "Didache," ix. x. (see "Didache," and compare I Cor. xi. 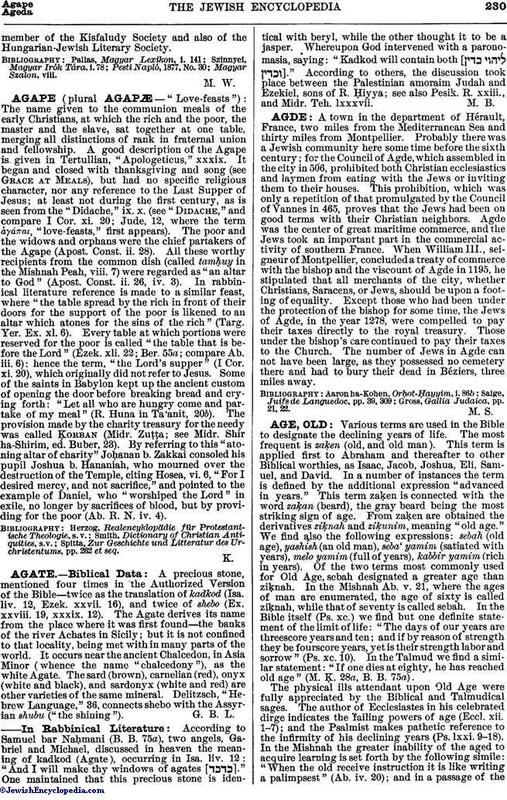 20; Jude, 12, where the term ἀγάπαι, "love-feasts," first appears). The poor and the widows and orphans were the chief partakers of the Agape (Apost. Const. ii. 28). All these worthy recipients from the common dish (called tamḥuy in the Mishnah Peah, viii. 7) were regarded as "an altar to God" (Apost. Const. ii. 26, iv. 3). In rabbinical literature reference is made to a similar feast, where "the table spread by the rich in front of their doors for the support of the poor is likened to an altar which atones for the sins of the rich" (Targ. Yer. Ex. xl. 6). Every table at which portions were reserved for the poor is called "the table that is before the Lord" (Ezek. xli. 22; Ber. 55a; compare Ab. iii. 6): hence the term, "the Lord's supper" (I Cor. xi. 20), which originally did not refer to Jesus. Some of the saints in Babylon kept up the ancient custom of opening the door before breaking bread and crying forth: "Let all who are hungry come and partake of my meal" (R. Huna in Ta'anit, 20b). The provision made by the charity treasury for the needy was called Ḳorban (Midr. Zuṭṭa; see Midr. Shir ha-Shirim, ed. Buber, 23). By referring to this "atoning altar of charity" Joḥanan b. Zakkai consoled his pupil Joshua b. Hananiah, who mourned over the destruction of the Temple, citing Hosea, vi. 6, "For I desired mercy, and not sacrifice," and pointed to the example of Daniel, who "worshiped the Lord" in exile, no longer by sacrifices of blood, but by providing for the poor (Ab. R. N. iv. 4). Spitta, Zur Geschichte und Litteratur des Urchristentums, pp. 262 et seq.